Former banker Bertrand Badré aims to re-direct global finance toward the common good. This visionary book’s foreword is by French President Emmanuel Macron. Britain’s Gordon Brown also supports Badré’s vision of finance for human development. 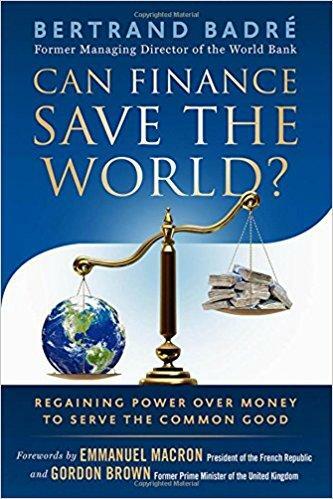 Author Bertrand Badré of “Can Finance Save The World?” Berrett-Koehler, (2018) served in top executive jobs at Lazard, Société General and Credit Agricole in Paris before becoming Managing Director of the World Bank and representative at G-7 and G-20 summits and chairing the World Economic Forum’s Global Future Council. French President Macron tells in his Foreword of his many years discussing global financial issues with Badré. They share the view that global finance has gone astray and that the 2008 crises “lifted the veil on this pernicious system. “They believe that there is an urgent need to regain control of the global financial system and steer it toward meeting the investment opportunities in shifting to the low-carbon energy transition, cleaner greener economies and a healthier human environment. All this is set forth in the United Nations (UN) Sustainable Development Goals (IISD.org) to achieve by 2030 and ratified by 195 nations in 2015.